AS China works towards meeting the commitments made to sustainable building, it is announced that the British Research Establishment (BRE) has been appointed by Hongsheng Construction & Investment Group Co. Ltd as chief sustainability advisor on a pioneering project to develop a major construction industry zone in ShangRao, China, a major conurbation located in the Jiangxi province which, with the opening later this year of the high speed rail-link, will be just 100 minutes from Shanghai. The new zone will become an elite address for operators committed to ongoing built environment improvements and is expected to house manufacturers, company headquarters, storage and recourses, trading and service centres and include residential accommodation, hotels, a shopping centre, conference centre and training centres. Hongsheng will develop several zones of this kind after the first zone is designed and built. Founder and CEO of Hongsheng, Mr Janhu Zhou said “we are delighted to collaborate with BRE and their key partners to shape the strategy for the zone, which will drive best practice in sustainable construction in the region. BRE will provide sustainability guidance in the planning phase for the construction industry zone in order to promote and enable sustainable development at every stage in the delivery process. Hongsheng Group has also enlisted BRE as key client advisor during the initial stages of the project to help arrange visits to construction material suppliers and product manufacturers through its vast network of industry contacts. The aim is to utilise the project and the collaborations formed to work on other new eco developments within the 27,000 sq km city. The Mayor of ShangRao, Mr Junqing Chen added: “Working with BRE will enable us to share knowledge and expertise in sustainable building in order to drive innovation in China’s construction industry. We hope to collaborate on the development of green building standards to embed sustainability across the construction industry zone and its supply chain.”The partnership follows a commitment made by Chinese Premier Li-Keqiang to encourage in-depth collaboration between China and the UK on sustainable building development. In 2011, Premier Li-Keqiang visited the BRE Innovation Park in Watford, Hertfordshire as part of a trade visit to the UK and was impressed by the array of low carbon buildings, technologies and innovations on display. He set out to showcase the best of British green building expertise in China to facilitate export sales for UK companies. He also resolved to use UK building regulations and environmental assessment methods such as BREEAM as exemplars to set the standard for sustainable building design and development in the Far East. Hongsheng Construction& Investment Group Co., Ltd aim to ensure the creation of a masterplan in line with their commitment to sustainable development for this construction industry zone. Therefore, Hongsheng Group has approached BRE to adopt a client advisor role during the initial stages of this project to help support the development of the strategic sustainable objectives for the construction industry zone. 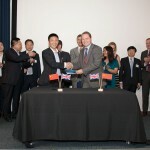 Pictured at the signing ceremony are Founder and CEO of Hongsheng, Mr Janhu Zhou and BRE Director for Scotland, Rufus Logan.